There are a few white bags plus imagery brands, but not many as good looking as this brand launched in 2015. Each flavour has its own colour coding, but it is done in an artful graphic fashion which hints towards the modern and hip, with a retro deign base aided by classic London imagery. The branding is at the top in black and white, the flavour is central to each design. The reverse adds to the simplicity, with the flavours expanded upon to include a detail... “Soho Inspired”, “Camden Sweet Chilli”, “South Bank”, etc. 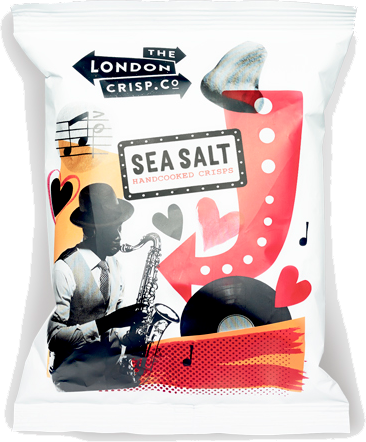 Along with the brand’s story, which is a little misleading - the Crisps are manufactured by Kolak, a major manufacturer that supply Crisps to supermarkets such as Marks & Spencer, Waitrose and Asda, plus Cash & Carry operations such as Bestway, under a variety of brand names. A perfectly consistent Crunch from start to finish, these hardy Crisps featured a brittle crack and crunch rather than a smashy munch. This is typical of Hand Cooked Crisps, but also very rewarding compared to many mass produced mush options. These were fairly traditional looking Plain Crisps. The colouring was a light yellow with some brown potato peel edges. There were oil boils, some large, some small. The bag was filled well with air and few Crisps were broken. There was also very little greasy oil and seasoning visible. High Oleic Sunflower Oil was the only additional ingredient added to the potato slices and the Salt. This was also the commanding flavour. 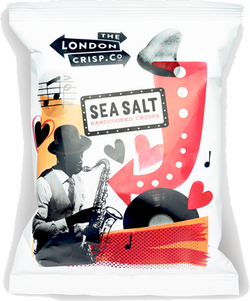 This is not exactly unique, but most ‘Ready Salted Crisps’ do not use this oil in the UK, thus the prominence in flavour comparison. They were a little greasy and not very salty. They were however, a very good companion to an all singing all dancing sandwich at lunch time. Back - The London Crisp Co.